For the American seismologist, see Charles Richter. For a review of different magnitude scales, see seismic magnitude scales. The so-called Richter magnitude scale – more accurately, Richter's magnitude scale, or just Richter magnitude – for measuring the strength ("size") of earthquakes refers to the original "magnitude scale" developed by Charles F. Richter and presented in his landmark 1935 paper, and later revised and renamed the Local magnitude scale, denoted as "ML" or "ML". Because of various shortcomings of the ML scale most seismological authorities now use other scales, such as the moment magnitude scale (Mw ), to report earthquake magnitudes, but much of the news media still refers to these as "Richter" magnitudes. All magnitude scales retain the logarithmic character of the original, and are scaled to have roughly comparable numeric values. Prior to the development of the magnitude scale the only measure of an earthquake's strength or "size" was a subjective assessment of the intensity of shaking observed near the epicenter of the earthquake, categorized by various seismic intensity scales such as the Rossi-Forel scale. In 1883 John Milne surmised that the shaking of large earthquakes might generate waves detectable around the globe, and in 1899 E. Von Rehbur Paschvitz observed in Germany seismic waves attributable to an earthquake in Tokyo. In the 1920s Harry O. Wood and John A. Anderson developed the Wood–Anderson seismograph, one of the first practical instruments for recording seismic waves. Wood then built, under the auspices of the California Institute of Technology and the Carnegie Institute, a network of seismographs stretching across Southern California. He also recruited the young and unknown Charles Richter to measure the seismograms and locate the earthquakes generating the seismic waves. In 1931 Kiyoo Wadati showed how he had measured, for several strong earthquakes in Japan, the amplitude of the shaking observed at various distances from the epicenter. He then plotted the logarithm of the amplitude against the distance, and found a series of curves that showed a rough correlation with the estimated magnitudes of the earthquakes. Richter resolved some difficulties with this method, then, using data collected by his colleague Beno Gutenberg, produced similar curves, confirming that they could be used to compare the relative magnitudes of different earthquakes. To produce a practical method of assigning an absolute measure of magnitude required additional developments. First, to span the wide range of possible values Richter adopted Gutenberg's suggestion of a logarithmic scale, where each step represents a tenfold increase of magnitude, similar to the magnitude scale used by astronomers for star brightness. Second, he wanted a magnitude of zero to be around the limit of human perceptibility. Third, he specified the Wood–Anderson seismograph as the standard instrument for producing seismograms. Magnitude was then defined as "the logarithm of the maximum trace amplitude, expressed in microns", measured at a distance of 100 km. The scale was calibrated by defining a magnitude 3 shock as one that produces (at a distance of 100 km) a maximum amplitude of 1 micron (1 µm, or 0.001 millimeters) on a seismogram recorded by a Wood–Anderson torsion seismograph. Finally, Richter calculated a table of distance corrections, in that for distances less than 200 kilometers the attenuation is strongly affected by the structure and properties of the regional geology. When Richter presented the resulting scale in 1935 he called it (at the suggestion of Harry Wood) simply a "magnitude" scale. "Richter magnitude" appears to have originated when Perry Byerly told the press that the scale was Richter's, and "should be referred to as such." In 1956 Gutenberg and Richter, while still referring to "magnitude scale", labelled it "local magnitude", with the symbol ML , to distinguish it from two other scales they had developed, the surface wave magnitude (MS) and body wave magnitude (MB) scales. (MMS), they are frequently reported by the press as Richter values, even for earthquakes of magnitude over 8, when the Richter scale becomes meaningless. Anything above 5 is classified as a risk by the USGS. The Richter and MMS scales measure the energy released by an earthquake; another scale, the Mercalli intensity scale, classifies earthquakes by their effects, from detectable by instruments but not noticeable, to catastrophic. The energy and effects are not necessarily strongly correlated; a shallow earthquake in a populated area with soil of certain types can be far more intense in effects than a much more energetic deep earthquake in an isolated area. , abbreviated MMS, have been widely used for decades. A couple of new techniques to measure magnitude are in the development stage by seismologists. scale gives somewhat different values than the other scales. The reason for so many different ways to measure the same thing is that at different distances, for different hypocentral depths, and for different earthquake sizes, the amplitudes of different types of elastic waves must be measured. , whereas the other magnitudes are derived from a simple measurement of the amplitude of a specifically defined wave. New techniques to avoid the saturation problem and to measure magnitudes rapidly for very large earthquakes are being developed. One of these is based on the long period P-wave; the other is based on a recently discovered channel wave. because most energy is carried by the high frequency waves. Because of the logarithmic basis of the scale, each whole number increase in magnitude represents a tenfold increase in measured amplitude; in terms of energy, each whole number increase corresponds to an increase of about 31.6 times the amount of energy released, and each increase of 0.2 corresponds to approximately a doubling of the energy released. Events with magnitudes greater than 4.5 are strong enough to be recorded by a seismograph anywhere in the world, so long as its sensors are not located in the earthquake's shadow. The following describes the typical effects of earthquakes of various magnitudes near the epicenter. The values are typical only. They should be taken with extreme caution, since intensity and thus ground effects depend not only on the magnitude, but also on the distance to the epicenter, the depth of the earthquake's focus beneath the epicenter, the location of the epicenter and geological conditions (certain terrains can amplify seismic signals). The intensity and death toll depend on several factors (earthquake depth, epicenter location, population density, to name a few) and can vary widely. Minor earthquakes occur every day and hour. On the other hand, great earthquakes occur once a year, on average. The largest recorded earthquake was the Great Chilean earthquake of May 22, 1960, which had a magnitude of 9.5 on the moment magnitude scale. The larger the magnitude, the less frequently the earthquake happens. Seismologist Susan Hough has suggested that 10 may represent a very approximate upper limit, as the effect if the largest known continuous belt of faults ruptured together (along the Pacific coast of the Americas). is the epicentral distance (in kilometers unless otherwise specified). is the amplitude (maximum ground displacement) of the P-wave, in micrometers, measured at 0.8 Hz. is mainly between 5 and 8.
is mainly between 3 and 5.
is the amplitude in micrometers. ^ Bolt 1993, p. 47. ^ Hough 2007, p. 57. ^ Hough 2007, pp. 57, 116. ^ Richter 1935, p. 2. ^ Richter 1935, pp. 1–5. ^ Richter 1935, pp. 2–3. ^ Richter 1935, p. 14: Gutenberg & Richter 1936, p. 183. ^ Richter 1935, p. 5. See also Hutton & Boore 1987, p. 1; Chung & Bernreuter 1980, p. 10. ^ Richter 1935, p. 6, Table I. ^ Richter 1935, p. 32. ^ Chung & Bernreuter 1980, p. 5. ^ Richter 1935, p. 1. His article is titled: "An Instrumental Earthquake Magnitude Scale". ^ Hough 2007, pp. 123–124. ^ Gutenberg & Richter 1956b, p. 30. ^ "Explanation of Bulletin Listings, USGS". ^ Richter, C.F., "Elementary Seismology", ed, Vol., W. H. Freeman and Co., San Francisco, 1956. ^ Hanks, T. C. and H. Kanamori, 1979, "Moment magnitude scale", Journal of Geophysical Research, 84, B5, 2348. ^ Woo, Wang-chun (September 2012). "On Earthquake Magnitudes". Hong Kong Observatory. Retrieved December 18, 2013. 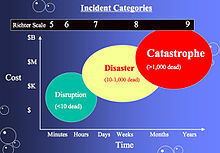 ^ "Richter scale". Glossary. USGS. March 31, 2010. ^ Di Giacomo, D., Parolai, S., Saul, J., Grosser, H., Bormann, P., Wang, R. & Zschau, J., 2008. "Rapid determination of the energy magnitude Me," in European Seismological Commission 31st General Assembly, Hersonissos. ^ Rivera, L. & Kanamori, H., 2008. "Rapid source inversion of W phase for tsunami warning," in European Geophysical Union General Assembly, pp. A-06228, Vienna. ^ Marius Vassiliou and Hiroo Kanamori (1982): "The Energy Release in Earthquakes," Bull. Seismol. Soc. Am. 72, 371–387. , from The San Andreas Fault System, California (Professional Paper 1515)". USGS: c6, p177. Retrieved September 14, 2008. ^ This is what Richter wrote in his Elementary Seismology (1958), an opinion copiously reproduced afterwards in Earth's science primers. Recent evidence shows that earthquakes with negative magnitudes (down to −0.7) can also be felt in exceptional cases, especially when the focus is very shallow (a few hundred metres). See: Thouvenot, F.; Bouchon, M. (2008). "What is the lowest magnitude threshold at which an earthquake can be felt or heard, or objects thrown into the air?," in Fréchet, J., Meghraoui, M. & Stucchi, M. (eds), Modern Approaches in Solid Earth Sciences (vol. 2), Historical Seismology: Interdisciplinary Studies of Past and Recent Earthquakes, Springer, Dordrecht, 313–326. ^ "Anchorage, Alaska (AK) profile: population, maps, real estate, averages, homes, statistics, relocation, travel, jobs, hospitals, schools, crime, moving, houses, news". City-Data.com. Retrieved October 12, 2012. ^ "Earthquake Facts and Statistics". United States Geological Survey. November 29, 2012. Archived from the original on May 24, 2010. Retrieved December 18, 2013. ^ "Largest Earthquakes in the World Since 1900". November 30, 2012. Archived from the original on October 7, 2009. Retrieved December 18, 2013. ^ Silver, Nate (2013). The signal and the noise : the art and science of prediction. London: Penguin. ISBN 9780141975658. ^ a b Al-Arifi, Nassir S.; Al-Humidan, Saad (July 2012). "Local and regional earthquake magnitude calibration of Tabuk analog sub-network, Northwest of Saudi Arabia". Journal of King Saud University – Science. 24 (3): 257–263. doi:10.1016/j.jksus.2011.04.001. Gutenberg, B.; Richter, C. F. (February 21, 1936), "Discussion: Magnitude and energy of earthquakes" (PDF), Science, 83 (2147): 183–185, doi:10.1126/science.83.2147.183 . Gutenberg, B.; Richter, C. F. (1956b), "Earthquake magnitude, intensity, energy, and acceleration (Second Paper)", Bulletin of the Seismological Society of America, 46 (2): 105–145 . Hough, S. E. (2007), Richter's scale: measure of an earthquake, measure of a man, Princeton University Press, ISBN 978-0-691-12807-8 . Hutton, L. K.; Boore, David M. (December 1987), "The ML scale in Southern California" (PDF), Nature, 271: 411–414, doi:10.1038/271411a0 .